I was invited to attend a fashion preview of a designer called Wan Hung for London Collections Men a few weeks ago at the W Hotel in Leicester Square. It was lovely and I took my cousin Amelia with me as I hadn't seen her in a few months so thought it was a great chance to catch up. After previewing a Spring Summer 17 menswear collection, we decided to grab a bite to eat. I knew that I had seen a place with a name that I found absolutely brilliant. Scoff & Banter. Two things which is my everyday activities. Although we didn't want a full on dinner, we previewed the starters from their dinner menu which had various goodies on there. We also both settled for the same mocktail which was super yummy. Amelia chose the King Prawns, Garlic Butter Emulsion - £9 and I chose Organic Salmon Fishcake, Lemon and Herb Mayonnaise - £7 and then ordered some amazing chunky fries and some olives because we felt fancy. My fishcake was a surprising size, normally when I order fishcakes for starters they come up quite small but this was a nice chunky size which was packed full of salmon. The lemon mayo dip was the perfect compliment with the fish as it really enhanced the saltiness of the fish. However Amelia's prawns were very small. The presentation was very pretty as it came on a shell and the garlic emulsion gently covered the prawns. For £9 it was a pricey prawn dish for what you got. Amelia did say that they tasted lovely, she just wished that she had more! 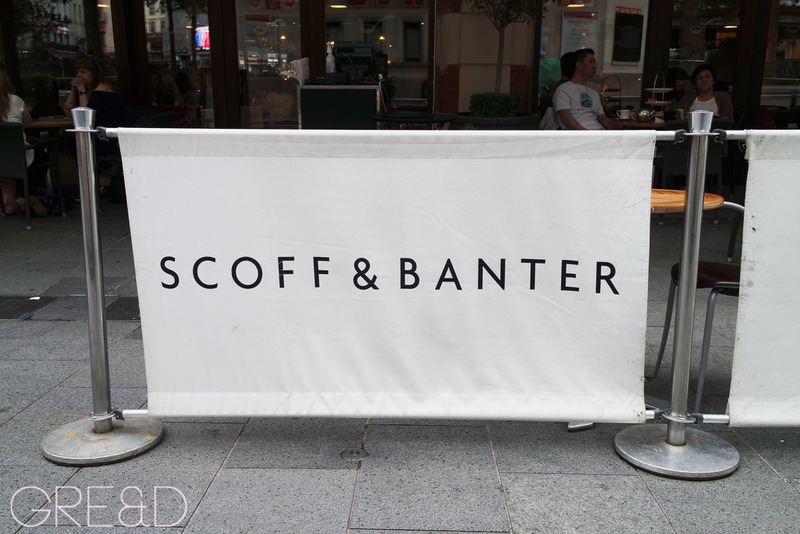 Scoff & Banter are a restaurant that specialises in British food. They have 6 sites all across London. The rest of the Dinner Menu looked lovely ranging from pies to fish and chips. Obviously not like the ones from the chippy, but done with a little more zaz. Currently they are doing a set menu of 2 Courses & a glass of house wine or beer for £20. So you know where I might be going next! Amelia and I most certainly scoffed and definitely bantered. You up for some banter?